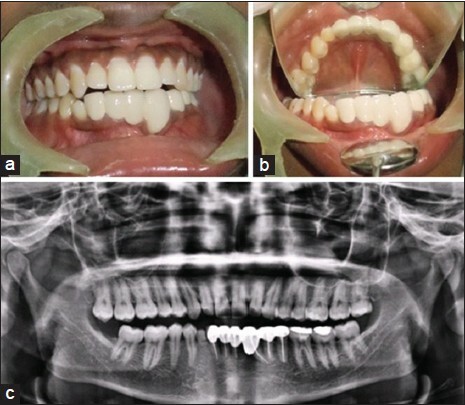 The present case is about a 21-year-old male patient of Indian origin reported with a complaint of mild pain and swelling in the lower front region of the jaw for the past 1 year. He claimed that the pain was not severe and occurred intermittently. The patient's medical history was not otherwise significant. Extra-oral examination revealed a diffuse swelling over the chin. Intra-oral examination revealed a diffuse swelling in the lower anterior vestibule extending from the region of 43 to 36. On palpation, the swelling was firm in consistency and egg shell crackling was elicited in some areas. 83 was retained and 43 was clinically absent. The panoramic radiograph showed a well-defined unilocular radiolucency extending from the mesial aspect of 44 to the mesial root of 36, extending to the mental foramen on the left side. 43 was impacted and the cystic lesion surrounded the crown of the tooth and extended for some distance along the mesial aspect of the root (circumferential variant). The margins of the lesion were well-defined, with a sclerotic border. Cone-beam computed tomography was also performed and revealed involvement of roots of 42, 41, 31, 32, 33, 34, 35 and mesial root of 46 [Figure 1]. An excisional biopsy of the lesion was performed under general anesthesia with conventional pre-operative medication cover and endotracheal intubation. A mucoperiosteal flap was raised from 44 to 37 region and the lesion was detached from the soft-tissue using blunt dissection and curetted out from the bony walls. 32 was extracted as the bony walls were destroyed. Complete hemostasis was achieved and the wound closed primarily with Vicryl sutures. External dynaplast compression dressing was given for 24 hours. Root canal treatment was carried out for 41, 42, 31, 33, 34 and 35. A vitality test was advised for 46 and treatment planned accordingly. 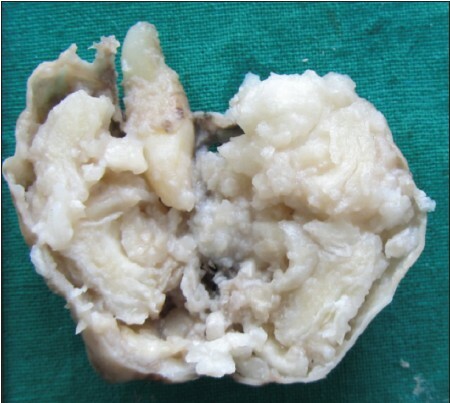 The specimen was sent for histopathological examination to rule out an OKC or an ameloblastoma. The patient was called for review and a post-operative Osteoprotegerin after 1 month. Macroscopically, a cyst in-toto with a tooth, measuring 40 × 30 × 40 mm in size [Figure 2] and four bits of tissue curetted from the surgical site were sent for histopathological evaluation. The cyst was sectioned in half and processed along with the four bits of curetted tissue. 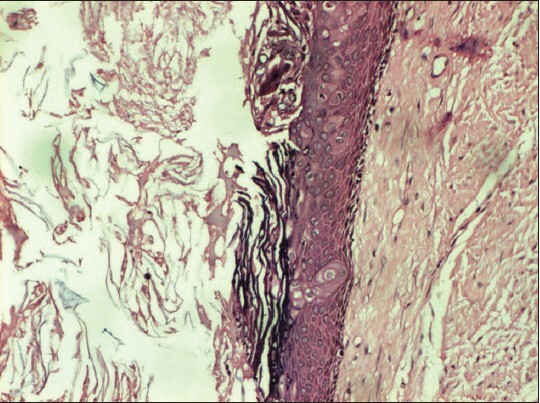 Microscopically , a fibrous connective tissue capsule in association with a non-keratinized cystic lining epithelium of varying thickness was observed. The lining epithelium exhibited focal areas of prominent granular cell layer. The lumen exhibited keratin flakes [Figure 3]. The four bits of curetted tissue microscopically showed the presence of hematoxyphilic substance, suggestive of keratin. Characteristically, the epithelial lining of a dentigerous cyst is not keratinized and most of those that have been described as keratinized have been ascribed to adjacent OKCs. However, taking into consideration the established criteria, the present case did not show any of the features that currently define OKCs. The patient was followed up after 1 year [Figure 4] and showed no clinical or radiographic signs of recurrence. The significance of keratinization in odontogenic cysts is not fully known. Keratinization is the final product of epithelial cell differentiation. However, dentigerous cysts, thought to arise from reduced enamel epithelium, are products of end cells, i.e. cells that have completed synthesis (enamel formation). Considering the age of the patient, it is possible that the dentigerous cyst is a primordial variant, arising from more primitive cells of the developing enamel organ. The keratinizing dentigerous cyst is an uncommon variant of the dentigerous cyst. 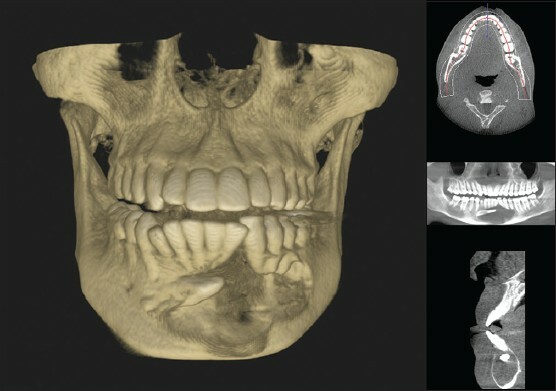 Long term follow-up of patients presenting with a keratinizing dentigerous cyst is advised to observe its potential for recurrence or malignant transformation since very little is known about this unusual entity. The authors would like to thank the Department of Oral and Maxillofacial Pathology, Ragas Dental College and Hospitals. 1. Neville BW, Damm DD, Allen CM, Bouquot JE. Oral and Maxillofacial Pathology. 3 rd ed. India: Reed Elsevier India Private Ltd.; 2009. p. 679-82. 2. Shear M, Speight P. Cysts of the Oral and Maxillofacial Regions. 4 th ed. UK: Blackwell Munksgaard; 2007. p. 59-75. 3. Samartano JG, Haar JG. A large keratinizing dentigerous cyst: Report of case. J Oral Surg 1971;29:60-2. 4. Pindborg JJ, Hansen J. Studies on odontogenic cyst epithelium. 2. Clinical and roentgenologic aspects of odontogenic keratocysts. Acta Pathol Microbiol Scand 1963;58:283-94. 5. Marx RE, Stern D. Oral and Maxillofacial Pathology: A Rationale for Diagnosis and Treatment. Chicago: Quintessence Pub. Co.; 2003. p. 886.